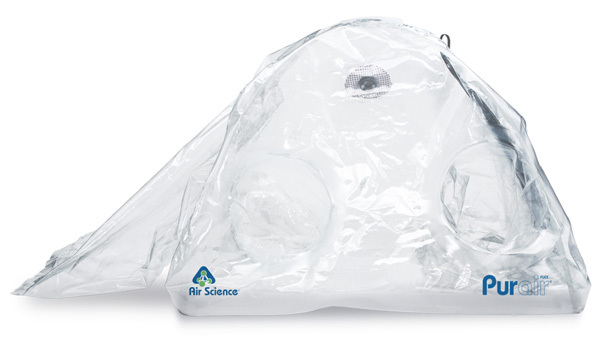 Air Science recently made mobile isolation options safer and more affordable through the update of their Purair® FLEX portable glove bag. The Purair FLEX is a revolutionary containment product that redefines when and where glove bags can be used. Designed as a flexible, highly portable film isolator, the Purair FLEX permits easy set up and delivers superior containment capability. The Purair FLEX features puncture-resistant construction with ArmorFlex® film which offers complete visual clarity and excellent solvent resistance across a range of chemicals as confirmed by independent product testing. The innovative curved design of the Purair FLEX provides more working volume than any other glove bag on the market and is supported by a set of semi-rigid support rods. The Purair FLEX sets up easily and is extremely stable, even if not inflated to full pressure. The Purair FLEX include HEPA filtration options, a built in Bag-in/Bag-out port, and a nitrogen purge inlet connection to create an oxygen-free workspace. ArmorFlex film complies with FDA 21CFR and 2002/72/EC standards for minimal outgassing, solvent and biological reactivity and static resistance. The Purair FLEX is constructed with FDA approved pharmaceutical grade LLDPE1 anti-static and ESD2 safe and meets European ATEX Directive. Air Science is an industry leader in the design and manufacturing of ductless fume hoods, biological safety cabinets, forensic laboratory cabinets, filtered and vented storage cabinets, balance enclosures, PCR workstations, total exhaust fume hoods and custom engineered containment and filtration cabinets. The company serves pharmaceutical, biotech, clinical, industrial, forensics and educational markets worldwide. For more information, contact Air Science today or visit the Purair FLEX product page.